Aggressive grinding can result in thermal damage and potential cracking of a ground part, but methods exist to detect grinding burns and cracks. Grinding is often a final machining step to achieve desired surface finish or final dimensions. Grinding is a high-energy process where a lot of frictional energy is concentrated over a small region . This localized energy is confined to the surface layers of the part being ground, resulting in a local rise in the surface temperature. Depending on the increase in temperature, changes in the residual stress state and microstructure can result. Cracking is the limiting case of residual stress. 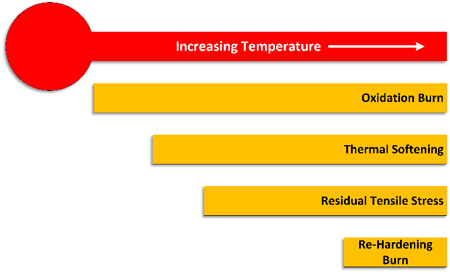 The relative temperatures at which the various types of burning occur are shown in Figure 1. Oxidation burn is primarily a discoloration of the workpiece. It is characterized by a typically blue temper scale on the part’s surface. The freshly ground surface of a part will form an oxide that changes colors due to thin-film interference as the part is heated. The part’s color or oxide film indicates the part’s temperature. Typical colors and respective temperatures are shown in Figure 2. Oxidation burn is observed on the ground surface and in adjacent areas. The surface temperature, as evidenced by the temper colors, indicates aggressive grinding. Thermal softening, which is a reduction of the hardness of the heat-treated part, occurs when the grinding temperatures exceed the tempering temperature. The temper colors can give an accurate indication if thermal softening has occurred. Residual tensile stress, with cracking as the limiting case, is due to thermal stresses exceeding the yield stress. This residual tensile stress can reduce the fatigue life of an in-service part. If the residual thermal stress exceeds the ultimate tensile stress, then cracking can result. This is illustrated in Figure 3. The residual stress can be from either mechanical or thermal effects . Mechanical effects and proper grinding result in a compressive residual stress at the surface. This is beneficial for fatigue. Thermal effect produces the opposite effect, with a residual tensile field at the surface. As the part is locally heated, the surface layer expands, but it is constrained by the lower undisturbed material. Compressive residual stress occurs at the surface. As the part cools, the surface layer contracts due to thermal contraction, resulting in a stress reversal — similar to that occurring during quenching. If the thermal stress is greater than the ultimate tensile strength, then cracking can occur. If the temperatures developed during grinding exceed the austenitizing temperature of the steel, transformation to martensite also can occur. This austenite, when cooled, transforms to martensite. Martensite, upon transformation, has a volume expansion associated with transformation. This expansion is on the order of 3 percent and is dependent on the percent of carbon present. This expansion, combined with the thermal stresses, can result in locally high residual stresses that can exceed the ultimate tensile strength and crack the part. This is known as re-hardening burn or cracking. This is illustrated in Figure 4 . Burning also can occur without cracking. A martensitic transformation can occur, but no cracking occurs. 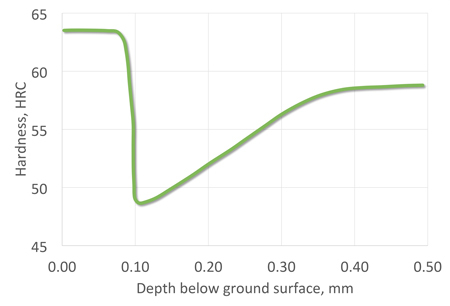 A cross-section through the material would show a high surface hardness with a soft heat-affected zone (see Figure 5). The carbon equivalent (CE) is a good measure of determining if the steel is prone to grinding cracks. It is identical to the carbon equivalent used to determine sensitivity to quench cracking. A common formula used to determine sensitivity to quench cracking and grinding cracks is the Dearden & O’Neill formula . The mechanism of quench cracking and grinding cracks is identical. The cracks are typically intergranular and follow prior austenite grain boundaries. The cracks, when opened, may have a light oxide film on the crack faces . There are four primary methods for the detection of grinding burns: nital etch, eddy current, X-ray diffraction, and Barkhausen noise. Nital etching involves immersing the part in a solution of nitric acid and either water or alcohol. This method is a large-scale method similar to that used for metallographic examination. The typical concentration of nitric acid is 5 to 10 percent depending on the process specification. 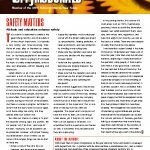 While alcohol (methanol) provides the best results, its use in a production facility is limited due to severe fire risk. Environmental and fire regulations often preclude the use of nital etching as an inspection method. Nital etching is time-consuming and not typically suitable for high production. It is still used for 100-percent inspection of low-volume aerospace applications, such as the grinding of landing gears. This method cannot be automated and requires an operator to make a judgment on the severity of the burn. 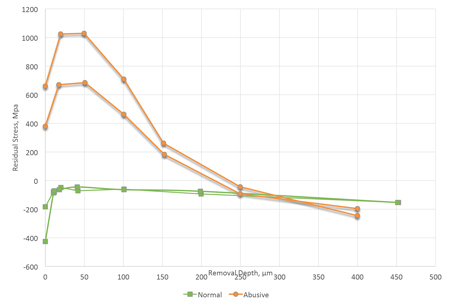 In some applications, the presence of any evidence of burn is cause for rejection (see Figure 6). One problem with nital etching is the potential to cause hydrogen embrittlement. This is particularly true if the heat-treated hardness is above 36 HRC. To avoid hydrogen embrittlement, it is necessary to perform a hydrogen embrittlement stress relief. This is performed at 275-350°F (135-176°C) for up to 24 hours. Eddy current is an effective method to detect grinding burns and does not suffer the environmental or fire hazards of nital etching. Like nital etching, eddy current testing will only detect a grinding burn if a metallurgical transformation has occurred. It can detect surface softening but is not able to detect residual stresses. It is an effective method for determining if a part has cracks. Eddy current testing can be automated but requires the method to have appropriate standards developed for the application. X-ray diffraction is the most sensitive method to residual stress. It is quantitative, but slow. It is performed in a laboratory setting and yields quantitative results. Examination of residual stress as a function of depth is possible but requires laborious surface removal. This can often obscure results if proper care is not taken to remove the progressive surface layers. Barkhausen noise is named after German scientist Heinrich Barkhausen at the Technische Hochscule Dresden, who discovered the Barkhausen effect in 1919. 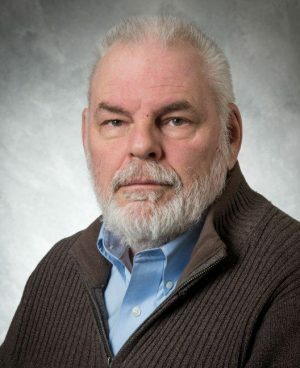 He discovered that when a changing magnetic field is observed in a ferrous material, the magnetism of the material changes in a series of small jumps. These discrete jumps in the magnetic field are the result of magnetic domains suddenly moving past lattice defects. This method is sensitive to residual stress and hardness, and it has a significant penetration depth . It is readily automated. It also is recognized by specification for aerospace and automotive applications . 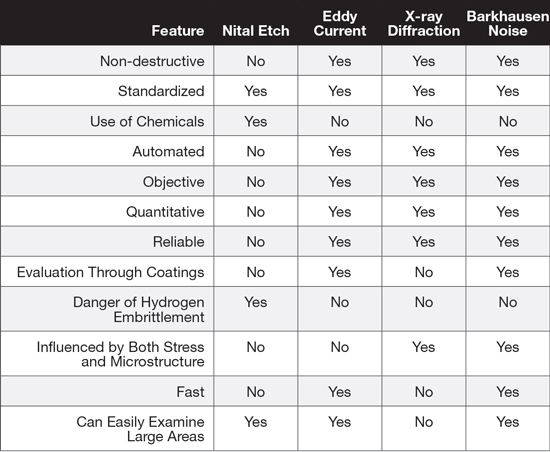 A comparison of the methods for detection of grinding burns is provided in Table 1. Grinding is used in many applications during final finishing of heat-treated parts. It is a high-energy process with much of the energy converted to heat. 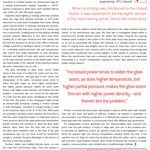 This heat can cause detrimental residual stress and microstructural changes that can reduce product life. Proper control of the grinding operation is critical to reduce grinding burn. Malkin, S. (1984). Grinding Metals – Theory and Applications. Journal of Applied Metal Working, 3 (2), 95-109. Sundarrajan, K. D. (2012). 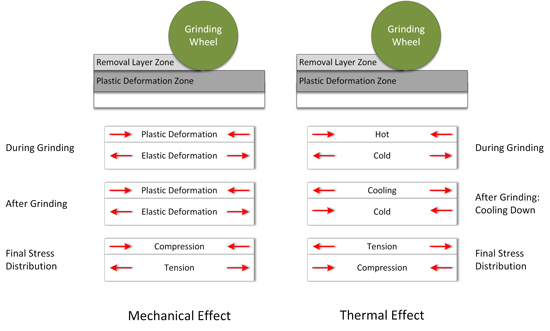 Study of Grinding Burn Using Design of Experiments Approach and Advanced Kaizen Methodology. Dissertations and Student Research, Paper 26, University of Nebraska, Industrial and Management Systems Engineering, Lincoln, NE. Badger, J., & Torrance, A. (2000). Burn Awareness. Cutting Tool Engineering, 52 (12). He, L., Li, X., Wang, G., & Rong, Y. (2010). 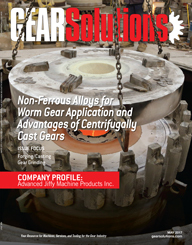 A preliminary study on an improved grinding process integrated with induction heating technology. Trans. NAMRI/SME, 38, 121-126. Lancaster, J. F. (1999). Metallurgy of Welding. Abington Publishing. Kunitake, T., & Susigawa, S. (1971, May). Quench Cracking Susceptibility of Steel. Sumitomo Search, 16-25. Neslusan, M., Cizek, J., Kolarik, K., Minarik, P., Cillikova, M., & Melikhova, O. (2017). Monitoring of grinding burn via Barkhausen noise emission in case-hardened steel in large-bearing production. Journal of Materials Processing Technology, 240, 104-117. SAE. (n.d.). Barkhausen Noise Inspection for Detecting Grinding Burns in High Strength Steel Parts. Warren, PA: SAE International. Wojtas, A. S., Suominen, L., Shaw, B. A., & Evans, J. T. (1998). 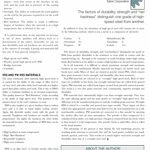 Detection of Thermal Damage in Steel Components After Grinding Using the Magnetic Barkhausen Noise Method. 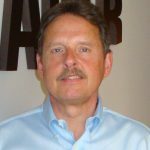 7th European Conference on Non-destructive Testing, May 26-29, (p. 41). Copenhagen, Denmark.